For a while now I've been really interested in making my own stamps. I think this stems from my love of fabrics. Printing my own fabrics is a distant dream of mine. 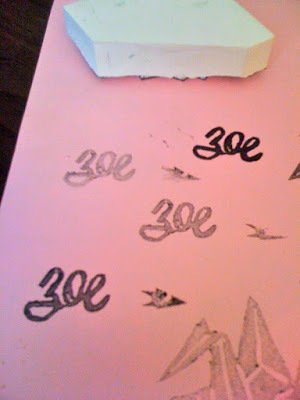 I ended up buying some rubber blocks and a lino cutter and went to town! First I literally traced my image on some vellum off my computer screen. I used a soft pencil and then pressed the paper against the white rubber and the pencil left a very good reverse image. Now you may think, well it's backwards so it's no good, not true! Because it's a stamp you want the image backwards, true story. I did a little experimenting with the cutting tool and it was surprisingly easy and fun! Like cutting butter. The rest seems to be common sense, I carved the crane first, then cut off the excess and had enough to make an additional "Zoe." Now I just need to get a better ink pad, lol. I guess the dollar store isn't always the quality choice. 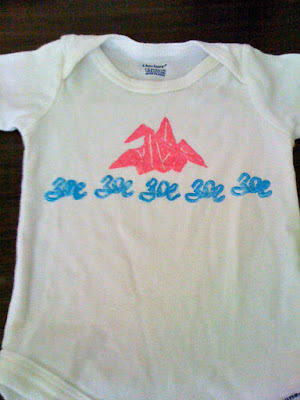 I decided to use some fabric paint and make a little onesie for baby Zoe. I'm into paper cranes right now. 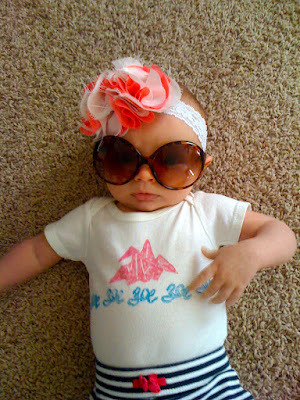 And here it is on an adorable baby model! Feel free to comment with any questions. This is fantastic! We are on a similar wave length too because I have been obsessing over these paper crane sculptures I've been seeing! One gigantic one for Japan earlier this year and some online, oh! also on that WOrk of Art show, and now on your fantastic blog! So so great. Your baby model is adorable as well. She's so fresh in her cool glasses. Love it!! Hey, remember that homemade mustache stamp you saw on Pinterest? Can you help me make one for Hunters bday party? Heck yes! Just message me an icon of the mustache you want or something.